Last week I was one of three speakers at the Manchester Xamarin Dev Days event, at Rise on Deansgate. A global event, from Microsoft / Xamarin, the developer day aimed to give attendees a hands-on learning experience, consisting of presentations and demos in the morning, and a hands-on lab / hack in the afternoon. For those that do not know, Xamarin is a cross-platform mobile app solution, enabling the creation on native iOS, Android, Windows and Mac Apps in C#. I have been using Xamarin professionally since 2013, for iOS Apps, and 2014, for Android. 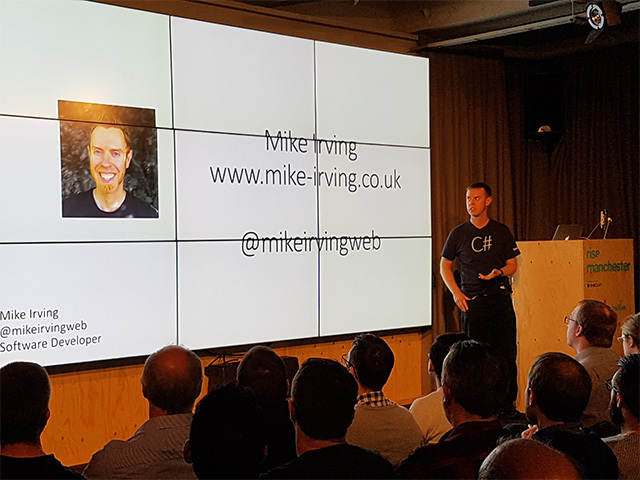 These events are ran by local Microsoft Dev Communities worldwide, and as part of Dot Net North, I became involved, alongside Pete Vickers and Peter Foot, who both have Microsoft MVP accreditation. I presented the third and final session of the morning, “Connected & Disconnected Apps with Azure Mobile Apps”. Turnout was great, around 75, mainly from the Dot Net North community, of which I am a co-organiser. I recently helped start up Macc Tech, a monthly tech community night for Macclesfield. I spoke at the initial meetup, my first public speaking gig in some time. In January, I will be speaking again at a Dot Net North event “Crossing the Windows Bridge for iOS”, giving a live demo of the aforementioned bridging technology.